At your next soiree, bring your boring old wooden appetizer toothpicks into the old-fashioned space age, which is a time long forgotten when we used to send brave astronauts out to explore the moon, with these cool new Lunar Landing Snack Picks. These fun astronaut-shaped picks plant the flag on your meatballs, cheese or sausage slices, or even a cocktail garnish and allow them to take a giant leap from the appetizer plate all the way your mouth. After their mission is complete, they're designed to safely return home to a drawer in your kitchen after a simple cleaning in the dishwasher. They come in a set of 12. 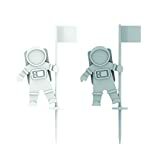 TrueZoo 4237 Lunar Landing Snack Picks, 0.25" Height, 2"